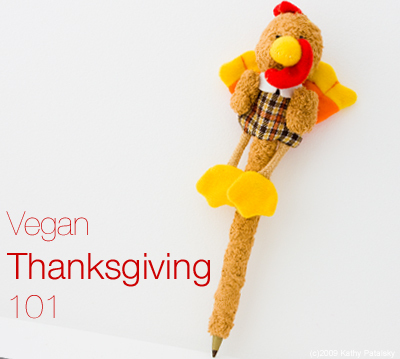 Vegan Thanksgiving 101: Tips, Advice and the Basics. Bring on my Vegan Thanksgiving! I'm so ready. Wait, you're not? Ah, I've been there. You're up half the night with nightmares of maple-glazed Tofurkys, drowning in a sea of vegan gravy. You have wild dreams of sliding down fluffy rice-whip-clouds into cinnamon pools of perfect pumpkin pie. Any mention of 'the holidays' and you break into a cold sweat and convince yourself that it's still October. And the snowman/snowflake/tinsel-infused 'holiday aisle' at your local drug store is making you nauseous. Holiday cards and Carol of the Bells already?! "Uh, not quite ready!" you plead, throwing your arms in the air, "...my Halloween costume is still draped over the towel rack in the bathroom!" Turkey - So many options, wait until my 'main event' post in this series! The Basics: General Tips and Advice. *Well Spaced Prep Schedule. DO NOT leave all your kitchen work until the day of Thanksgiving. That will make you nuts. There are plenty of dishes that can be made ahead of time and stored in the fridge, such as cranberry sauce, pies, appetizers, cold veggie dishes and salads. If you can make ahead - do it. Thanksgiving isn't about perfection, it's about family and friends. You'll want to spend more time with your guests that making everything day-of fresh. And guess what, some dishes actually taste better sitting in the fridge for a day! *Outsourcing. Yes I'll admit that sometimes I get tempted to simply send in my entire Thanksgiving meal order to Whole Foods and put my kitchen to rest on Thanksgiving. But then I stop stressing and remember how much I love to cook and how satisfying a homemade Thanksgiving meal can be to make and eat. But guess what, it's perfectly OK to outsource a few of your meal items. Pies can be purchased from vegan bakeries (like BabycakesNYC and One Lucky Duck here in NYC.) And you can even get gourmet vegan cheese online from Dr. Cow. And if you really want to order something from Whole Foods or another vegan-friendly establishment, go for it. I won't tell. But the more you make yourself, the better. *Dish Labels. Be sure to place little labels in front of your dishes if you are not going to be around to explain what is in them. This applies mostly to the "appetizers table". Labels aren't needed for the dinner table. Discussing your dishes outloud makes for perfect dinnertime conversation. *Green Meal: From Glass to Plate to Farm. Keep in theme with your cruelty-free 'green' Thanksgiving feast and make sure to add a few green accents to your meal. Don't use paper/disposable plates or napkins (even for appetizers). Also, make sure to purchase organic ingredients and biodynamic and/or organic wines. Sustainable and local ingredients are always a plus! Head to your local farm market for some locally harvested fall squash or locally made vegan apple butter. *Bring-a-Dish. It's always nice when guests offer to bring a dish. Let them! 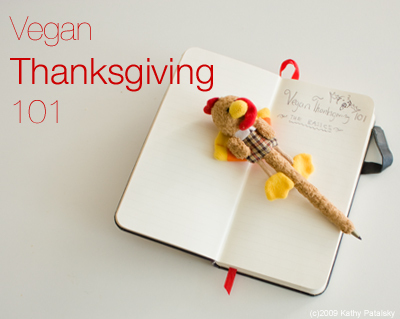 But be sure to communicate that you are having a vegan Thanksgiving meal. If your guests offer to bring their favorite non-vegan dish, it's your call as to whether you want a 100% vegan table or not. You can always politely challenge them to 'veganize' their dish. Offer your advice on ingredient substitutions they can make. Most cooks will like a good kitchen challenge! *Traditional vs. Progressive. You'll want to keep a good balance of tradition and innovation in your dishes. If you want to have tempeh sticks, seitan skewers and braised tofu at your table - that's great. Just be sure to keep the basics around: cranberry sauce, stuffing, mashed potatoes, gravy, rolls, fall veggies and marshmallow topped sweet potatoes all vegan of course. Thanksgiving is all about traditions, savoring the old and creating the new! *Homemade-Musts. There are a few things I beg of you to make from scratch (And not a store-bought mix) 1. Stuffing. Please don't buy the boxed or bagged mix. It is always overly seasoned with salt and sometimes chemicals! Use your own day-old bread, the flavor difference is like night and day. 2. Cranberry Sauce. OK, I love that jellied straight-from-the-can stuff too. So I like to have a variety of cranberry sauces. One I make from whole berries and maybe one with the can ring lines...just for old times sake. 3. Pie. If you want to buy your pie from a seasoned vegan baker, go ahead. But those mass-made supermarket pies are no substitute for the real homemade thing. 4. Mashed Potatoes. No instant potatoes please. 5. 'Yams' Just because it says yams on the can doesn't mean they taste like yams. Please use real whole fresh sweet potatoes for all your 'yam' dishes. 6. Gravy. Make it from scratch. It's too easy. Vegan-gravy-in-a-can subs need not apply. * Get an RSVP. Be sure to get a count of your expected guests. Sure this may change last minute, but getting an early estimate is essential to menu planning. * Special Diets? Give your guests the same respect that you expect when dining out - ask them if they have any special diets, food allergies, dislikes, likes or other dietary restrictions. Are they on a low fat diet? Low sodium? Kosher? Gluten-free? Get this info before you start menu planning. * Schedule. Communicate to your guests how the day will progress. In your invite you may want to give an estimate time for when drinks/appetizers will be served and when the expected main meal dinner time will be. Even a casual schedule can be helpful to guests, especially if they have low blood sugar issues or might be diabetic. * "I don't like green beans!" Be sure and ask the parents if their kids have any specific hates or loves when it comes to food. Also be sure to ask about food allergies or sensitivities. * The V Word. Young kids won't know what vegan means. And quite frankly that's OK. Don't try to force the word vegan into a discussion about the food. It doesn't have to be vegan pumpkin pie. It's just pumpkin pie! Just let the kids eat and enjoy. Let the parents do the food discussions with them later - if they choose. * Hot Dog or Soy Dog? Most kids will eat something that looks familiar. If they see a slice of pizza, they will eat it, even if they don't know that the pizza has a gluten-free crust and is topped with soy cheese and soy pepperoni. So make sure that you have some food options that look simple, traditional and kid-friendly. Kids don't care about the lemon confit drizzle or the garlic puree garnish. * The Anxious Parent. If the parents insist on bringing some non-vegan dishes for the kids 'just in case' - let them. A gracious host makes for happy guests. And I'm guessing the kids won't be able to stop scarfing your cheesy tempeh sticks and butternut squash dip. The Basics: Pre-Meal. Make a Good First-Veggie-Impression. * No veggie sticks! OK, some veggies sticks are OK, but make sure you have some awesome hearty vegan dip to go along with them. You don't want to start off with a cliche munchie. *Keep it Simple. Don't go overboard on the fancy appetizers. You know your main meal is going to be labor-intensive, so make sure your apps are easy! Anything you can make ahead and simply pull out of the fridge or warm/toast up in the oven is best. * Vegan Tasting. I like to make my appetizers traditional, yet vegan. I'm not going to put a big plate of tempeh cubes with flax seed crackers as appetizers. I'd rather put out some butternut squash dip and vegan cheese and crackers. Why? Unless your guests are seasoned vegans, they might get scared off by too many new ingredients at the start of the meal. Give them some familiar looking basics to warm their palates. Leave them wanting more! * Beverages. Make sure to have plenty of beverages on hand when your guests arrive. And not just of the alcoholic kind! Travel can leave your guests feeling dehydrated, so a plentiful supply of water, coconut water and fresh fruit juice is a great idea. Self serve pitchers make it easy on you. * Palate Cleansers. I love palate cleansers. Fresh pressed ginger-lemon-apple juice is a great one. Or a small spoonful of zesty lemon sorbet. Some raw fennel sticks are a great digestive and palate cleanser. Or even lemon ice water will do the trick. If you serve your pre-meal palate cleanser in individual small cups/spoons your guests are more likely to engage in the 'palate cleansing' process. *Beyond Tofurky. There is something psychologically pleasing about having a 'centerpiece dish'. And you guests will probably agree. No turkey on Thanksgiving? Quite a stretch for some. But there are so many options for a meat-free meal. Yes you can buy a Tofurky. That's the mindless and I'll admit, 'fun and kitchy' thing to do. Or you can do a less traditional protein main-dish from ingredients like tepeh, seitan or tofu. Or you can do some savory beans paired with rice. Lentils are fabulous. Vegan Sausage is always a crowd-pleaser and even an elegant pasta or risotto dish may do the trick. Remember, you don't need a "main event" dish as a turkey-substitute, but if you want one the options are out there. I'll have more on this later in the series. *Inspire Me. My favorite part of Thanksgiving is actually the menu planning! I love to get creative with my ingredients, themes, twists on tradition and innovative recipes. Its not hard to find Thanksgiving inspiration all around you this time of year: plump pumpkins, magenta cranberries, dusty fall leaves, apple butter, crisp air, barrels of fresh apple cider, steamy muffins, spiced holiday chai, lumpy bumpy squash varieties with character, shiny tangerines, persimmons, nutty crumbly chestnuts, warm coats, squishy scarfs and that mellow blue dusk sky. Fall is everywhere, go out and taste it.